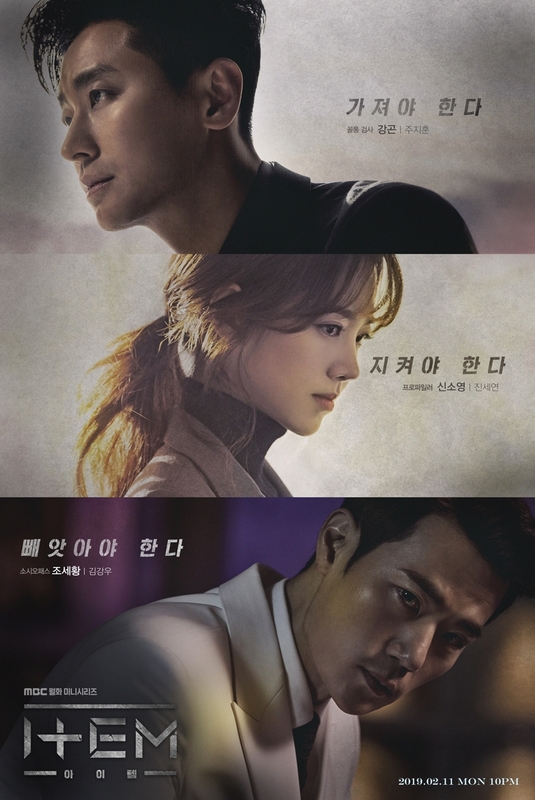 "Item" takes over MBC's Monday & Tuesday 20:00 time slot previously occupied by "Less than Evil" and followed by "Special Labor Inspector" on April 8, 2019. Ju Ji-Hoon and Jin Se-Yun previously starred together in 2012 SBS drama series "Five Fingers." Mona Apr 11 2019 6:57 am The writer probably got the inspirations from series of Poltergeist the legacy. Ryu Samuël Apr 10 2019 1:36 am I really love dthis drama despite many plot holes. Jin Se Yeon is so sweet! I loved how the ending episode was touching even if it feels like it was rushed. I enjoyed seeing the main team becoming best friends! But I don't really understand why the scenarists don't know how to end a drama. Seriously it was a bit stupid. Who's that girl with an Item? What kind of Item is it knowing that the previous ones came from the Dream World Park? Kim Ai Za Apr 07 2019 6:52 am SPOILER! I'm pretty sure that Se Hwang didn't die yet because the body was completely burned. And there's no way to identify the body is Se Hwang. The bubblegum girl is actually save him. Well, that's actually just my random guess. Director, writer, please make another season of Item. I need more. I really mean it! Please...please... ??? D33 Apr 07 2019 3:08 am Anyone knows the title of the song that Da In was playing? HwaKin Apr 06 2019 3:57 am I bet, the girl with necklace and bubble-gum was young Kang Da-In from the future. Davia Apr 06 2019 12:13 am The drama starts off really interesting, but when we got to see the hokey tower I started having my suspicions on there being any intelligent answer to the mystery. The further we went along it seemed the writer was boxing himself in more and more with no way out. Spoiler: Sure enough with the start of episode 31 it became obvious. The writer changed tactics and genre completely to a bunch of schmalzy scenes so as to draw our attention away from the fact that the writer didn't know what to do. Oh yes and let's throw in a mysterious character with a necklace so as to derail the audience even more. For me the final insult was when So Young went to visit Se Hwang in jail she didn't even try to get any clues from him as to what might have happened to Kang, etc., etc. And the obvious reason why is because the writer didn't know how to explain any of it. So the tactic became let's pretend that none of what happened before is worth addressing! Oh, and she didn't even in the slightest look surprised or startled when he suddenly shows up at the end. LOL I'm sorry to say but this was possibly the stupidest ending I've ever seen. Thankfully the actors where wonderful. Must say that final scene with the police chief when he apologized for not believing So Young before was one of the best bits of acting I've seen. I think his name is Kim Do Hyun. Nouur Benabbes Apr 05 2019 3:26 am There is no way they end a drama like that. There will definitely be a season 2. The last Item was the clown's hat and not the necklace the girl was wearing. That necklace must be an Item for another story. Im pretty sure they'll change the cast as well, since all of them dropped their jobs as cops/prosecutors. And Im also pretty sure that the girl is not Sehwang, she's probably another psycopath who loves to play games. But still, there is so much unanswered questions about the last episodes.. It wasnt bad overall, but could be a lot better tbh. Har Aaron Apr 04 2019 12:00 pm Can someone tell me who is the last episod girl with necklace? Real name. However, this is my first time watching k drama and getting confusing about the ending. In my opinion, this is hint for another season. Just my opinion only. How about other? Black parade Apr 04 2019 1:01 am New character? Hint for season 2? If there is season 2 I'm not going to watch it. In Any ways, still it's worth the watch because of Ju Ji-Hoon and Kim Kang-Woo. I just hope next time there'll be a better story. It would be a waste not to maximize the talents, skills and brilliance of these two great Korean actors. Peterh Apr 03 2019 4:20 pm a rip off from the tv series the lost room. Which was better written. 1) Se Hwang was successfully using his wealth to get himself out of trouble again. 2) Se Hwang was confident he was going to receive minimal punishment for killing all those people. 3) If Se Hwang presented himself as dead he couldn't claim all his money and he wouldn't give that up. FanForLife Apr 03 2019 10:42 am The ending was not disappointing, as usual some K-drama fans just didn't understand it. The woman with the necklace is Se Hwang, smiling his crafty, evil smile. They switched identities, like the priest and the young man. Se Hwang didn't die. He lives and leaves the jail under his new identity as a woman. Just like in real life evil is never completely vanquished, even by good. The devil lives on. Vaun Apr 03 2019 9:46 am Confusion start from ep.29 onwards... Kang Gon was hugging the girl with bomb and So Young used the mirror to shine on him, then? Thereafter.... lie on bed? Follow by new character and more confusion... upset over the last episode after watching it diligently.. In the "wish room" Kang Gon says to Da In: "Let's go home." Da In goes to the real world, Kang Gon goes where? His father says to him, "I can give you any wish." Kang Gon was spending time with family. arxane Apr 03 2019 6:58 am I'm just going to vent a bit here, OK as a viewer that didn't have high expectations,. I found it amazing how this drama made me watch its slow progress until episode 28-30, though I was slightly discouraged by the characters development. I still watch it because I mean come on the cast was a great choice but why write the character more on the emotional side. Secondly, had it not been the ending? What just happened, why the new character already!? Like I had really hope it was a one season with a clean ending that was thrilling like the other last 3 episode. As they were stepping into the light, Kang Gon says: Let's to home. Da In returns to the real world. Kang Gon returns to ? I think Kang Gon just wanted to spend some time with his other family. Da In: I had a good dream last night. So Young: I did too. So Young dreamt of her father . . . Da In dreamt of? That necklace was the last item. Not the clown hat. I thought this series was flawed, but entertaining. seolhyunari Apr 03 2019 4:26 am That ending............ very dissapointed who is that girl ?? wanna make season 2 ?? Emma Apr 03 2019 4:16 am Omg whats with the ending???? I am confused beyond words. What is happening? I dont get why they introduce a new character on the last episode?? To tell us there is part 2 or what? Been diligently catching up with this drama. Though some scenes were cringy (thank goodness for forward button) overall its not bad. But i’m sorry, like what happen to the dad? And where did kang gon go to and what happen to other character? Why was he there for so long..
Is the ending an indication that there’s part 2? Or the directors want us to read our own webtoon? Or want us to use our imagination for the ending? Someone. Explain. The ending. Is Kang dead? Is he back? That was the island they were all on? Are they all dead???? What did Kang wish for???? Who is that girl at the end with the necklace m??? Why can she walk through walls?? Is Jo-se Hwang dead???? The K Mania Apr 02 2019 3:12 pm The actors are outstanding, especially all the gentlemen and Kang Da In. The concept and main plot are interesting. However, the pace and how the story flows and details are meh. Migthy Thor Mar 28 2019 11:11 pm Such a mind blowing drama. With a cast combination of Ju Ji-Hoon, Kim Kang-Woo and Park Won-Sang ... this drama should rate high! Unfortunately, it didn't suit the taste of the Korean audience. But as for the international audience, it's a sky rocketing "blockbuster" !!! Kori023 Mar 28 2019 12:00 am I’m surprised this drama doesn’t have 15-20% viewer ratings. It’s a pretty good drama. Great cast & interesting story. Give it a chance kdrama viewers. pepper Mar 26 2019 8:48 pm getting bored.. jo se hwang got more screen than kang gon..
Ore-sama Mar 24 2019 10:47 am The idea is interesting and fresh..however the story flow are slow because of too many boring scene..a lot scenes needs to be portrayed/directed better & effectively..i agree with the comment below mine. ITEM Mar 24 2019 8:57 am The plot is interesting and quite unique. Also, the actors are really good but I'm really frustrated at why the prosecutors and police force are lacking some critical thinking at the most important scenes. I know it's not fair to compare this to CSI and the like because this is a fantasy drama but the most obvious things are missed or the writer just really wanted to concentrate on showing that the characters' emotional side. One of it is how they didn't really discuss about the killer priest at the time the incident happened (where Ju Ji Hoon almost got killed at the rooftop). It was just brought up again few episodes later when this should've been a key to figuring out the item he was using and as to the "supernatural" element of it. Nonetheless, I will continue watching this for what it is. arxane Mar 20 2019 1:40 am i watched the drama, honestly props to the actors and actresses for nailing their character and good storyline but why must it be so draggy?!?! i decided to watch it until ep 20 so far because i thought who knows there's probably something shady going on if i just hold on, but it gets slower and complicated. Zal Mar 19 2019 6:53 pm Why became so complicated.... Till when JoSeHwang act to be deity? Corea Mar 11 2019 12:27 am This drama has an interesting plot... but so so draggy. Piro Mar 10 2019 9:58 pm I watched 5 episodes of this 2x cause it was so boring and I still skipped some parts. I am out !! Krist Mar 10 2019 8:30 pm I love this korean drama. Many intense and unpredictable scenarios. Can't wait to watch the next episode. AwesomeKDramas Mar 07 2019 11:21 am The Item is unique and spellbinding (some might think literally!). If you are tired of Korean dramas that are so predictable you know how they will end by episode 1 then check this one out for a cool change of pace. It keeps you on the edge of your seat. All the actors are superb. Emma Mar 05 2019 9:56 am Gave this series a chance and i’m already hooked!! Too many unanswered questions but i hope revealation will be out bit by bit so that the mystery still remains! I really like this series and recommend people to watch! Just finish ep 14 and now waiting for next week! Ju Ji Hoon is awesome as usual! Santi Widjaja Mar 03 2019 10:08 pm i watch th drama because i fans of Ju Ji Hoon. the more i see the episode, the more i love it but also the more question i got. i know this is fantasy drama but i still hope there will be explanation : 1. why the villian got so many items? 2. why the father of so young got the album for the first place & know how to used it? 3. why the priest let go of Ju Ji Hoon on the rooftop and why Ju Ji Hoon can run and his body seem had quick recovery with so many bruist all over his body because of the priest ? every episode still got holes in the story, ( like drama "W") but still i love it and will watch till end. Licorice Feb 27 2019 1:01 am I wonder why the rating isn't good? I like this drama. It's so intense and full with mystery. Too many bad guys and people involved around the items. More importantly, WHO created these items? Are the villain boss and villain priest work together? I wonder if the villain boss installed an item to himself that connected to the polaroid? I think the police junior isn't a good guy, he has an item as well, but I don't think he will hurt Soyoung. Kang Gon and Soyoung are hopeless and powerless. They need more allies and backup to defeat those villains. Malcolm Feb 24 2019 10:43 am I`m seeing a hell of a lot of similarities between this an The Lost Room...a lot of them..
honestcritics Feb 20 2019 4:05 pm The plot is okay, but it seems to drove off from what it should be. I have a high expectation but ugh now its not that high anymore. First, Ju ji Hoon acting is great and the chemistry with Jin Se Yeon is ok too, but I cant feel the villain mode when he appeared. I skipped the parts when the villain appeared bcs its too bored for me tbh. Plot 4/10, and acting 7/10. For cinematographic I would give 5/10. Aracelly Feb 16 2019 7:21 pm I am loving it already!!!! Hasta ahora estoy pegada. Me encanta. Todos los personajes muy bien actuados y buena química. Rose R. Feb 13 2019 1:45 am Very interesting plot Ju Ji Hoon and Kim Kang woo are such a great actor to watch with.. ❤️ Really excited for the next episode. Migthy Thor Feb 11 2019 8:31 pm First Episode is such an Explosive! I hope the writers Min Hyung (webcomic), Kim Joon-Seok (webcomic), and Jung Yi-Do and the director Kim Sung-Wook maintain such HYPE, unlike many Korean dramas these days, it started with the bang then unable to sustain the height, it fluctuates to such disappointments and frustrations. "ITEM" is such a power-house cast, with Ju Ji-Hoon, Kim Kang-Woo and Park Won-Sang, nothing less is expected! The story seems brilliant, cinematography and effects were awesome, Stunts were amazing! This must be such a "HIT"
scs Feb 10 2019 6:24 am hi, does any one know whats the name of music in teaser2? Nora Jan 06 2019 9:16 pm Ohh so excited!! But will there be any romance in this drama ? Shairli Jan 03 2019 9:19 am Looking forward for ju ji hoon & kim kang woo. dont quite favor the lead actress. Areej Dec 22 2018 2:40 am i love all kim kangwoo's drama and movie ju jihoon as well i can't wait for this .!!! Liaa Sep 11 2018 9:41 am Kim Yoo Ri is back!!! 팬이야 Sep 10 2018 4:54 am Long time no see (in k-drama) oppa ?